A leaked trailer for Godzilla popped up a month or so ago and was promptly pulled. But before it was, it was abundantly clear that this Godzilla is not the same as the 1998 Roland Emmerich version. Today Warner Bros. dropped the official version and it too makes no allusions that the radioactive dinosaur/lizard-monster is trying to find its way and ultimately live alongside humans in solitude. In fact it seems its sole purpose is mankind’s destruction. Like the unofficial version (embedded below), there are few clear shots of the iconic creature (the dust and smoke immersed shots are more intense anyway) and plots points of the movie are still kept under wraps. The scenes of utter chaos, however, are plenty enough to get viewers charged to see more. Take a peek of the trailer and then watch it again. At least initially it looks like they’re doing the Toho creation justice. 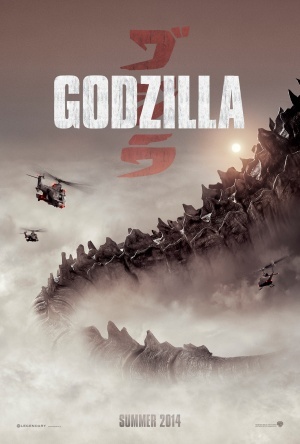 Godzilla stars Aaron Taylor-Johnson, Elizabeth Olsen, Bryan Cranston, Juliette Binoche, Sally Hawkins, Victor Rasuk, and Ken Watanabe. Godzilla devastates US and UK theaters on May 16, 2014. I prefer the Oppenheimer trailer. If it is still available online you should append so others can compare the two. The second trailer is so much more ominous. What the hell are a two dozen paratroopers going to do to a massive radioactive monster that missiles, bombs, bullets, lasers, sound cannons and ion beams couldn’t? My hope: they’re going to get under Godzilla’s scales and inject a neurotoxin into him. In reality they’re probably on some search and rescue mission. There is a high value target that must be extracted . . . I am ready for giant monster movies. Godzilla as it is supposed to be. This movie is gonna be intense. There is more to the story than just Godzilla destroying San Fransisco because he wants to. There are other kaiju attacking the populace – Godzilla is probably locked in battle with them and we puny humans are collateral damage. We’d still be screwed. At a minimum, Godzilla would be a Category 10 kaiju. If memory serves, our Jaeger force couldn’t stand up to a Category 4. Happy to finally see a trailer build anticipation for a movie without spoiling its most critical scenes. That roar sent a shiver up my spine. Awesome introduction. I pray they don’t sandwich a love story somewhere in it. Love stories always ruin a good monster movie. “Now I become death, the destroyer of worlds.” Perfect. Why does it say the movie is rated R? Its PG-13. Studio(s): Disruption Entertainment, Legendary Pictures, Warner Bros.